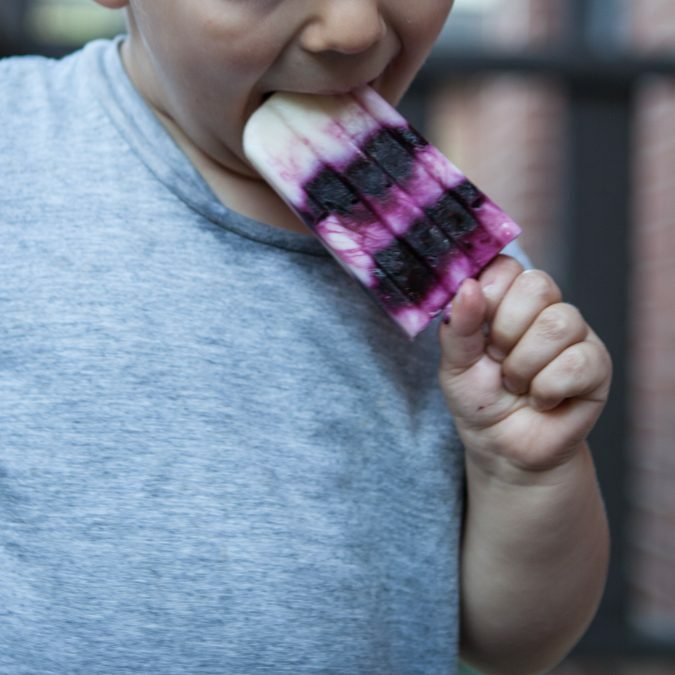 Maria and Stephanie wrote this recipe for raspberry pops, but I was specifically looking for something to do with our blueberries – so there you have it. But feel free to use any summer berry you like. I ended up straying from instructions a bit and cooking down the berries with sugar and lemon juice to make the mixture a bit jammier before throwing it into the food processor; this is nice, too, because it allows you to use frozen berries instead (or along with) fresh, so these can be a season-less affair. In a small heavy-bottomed saucepan, cook down the blueberries, lemon juice and 2 tablespoons of sugar for 2-3 minutes, or until berries soften and become a little jammy bit and sugar is dissolved (if using frozen berries, this will take longer). Let cool, off the heat, for 10 minutes. In a blender or food processor, blend the berry mixture until liquified. In a small mixing bowl, whisk together yogurt, remaining 3 tablespoons (40g) sugar, and vanilla extract. Dividing evenly, layer the blueberry puree and vanilla yogurt in the pop molds until they’re nearly filled (leave 1/4-1/2 inch at the top for expansion). To create the swirls, gently poke each pop with the end of a chopstick before placing the lid on the mold and adding the popsicle sticks. Freeze until firm, at least 4 hours. To remove the pops, run warm water over the outside of the molds and slide them out. Store in the freezer in an airtight container between layers of parchment or wax paper.